The genus name, Lobelia, honors the Flemish botanist Mathias l'Obel. Lobelia is native to eastern North America and Europe. It can be either an annual or biennial and ranges from 6 inches to 2 feet in height. The leaves are alternate, sessile, ovate-lanceolate, veiny, and covered with hairs. The numerous tubular, fivelobed, hermaphroditic flowers are pale blue and originate from the leaf axil. Lobelia grows along roadsides and in both pastures and woodlands. The plant flourishes in moist, partially shady conditions in most types of soil. The root of Lobelia was used by the Iroquois to treat syphilis, hence the species name siphilitica. Lobelia was included in the United States Pharmacopoeia from 1820 until 1936 and in the National Formulary from 1936 until 1960. Lobelia moves stagnant chi, relaxes and strengthens the nerves, calms spasms, opens and relaxes the respiratory system, allowing oxygen to flow more freely, and stimulates the vagus nerve, thereby having an emetic action when used in large amounts. 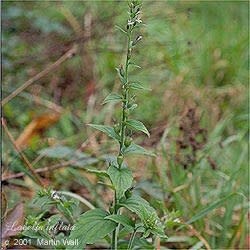 Midwives once used lobelia to relax the pelvic muscles of the woman in labor. Lobelia also enhances the activity of other herbs. Lobelia is used to treat allergies, asthma, bronchial spasms, bronchitis, catarrh, convulsions, diphtheria, dyspnea, edema, epilepsy, hysteria, laryngitis, muscle spasms, rheumatoid pain, pleurisy, sciatica, syphilis (root), tetanus, tonsillitis, wheezing, and whooping cough. It is sometimes smoked in a water pipe to treat asthma or bronchitis. Topically, lobelia can be used as a gargle to soothe sore throat or a wash, compress, liniment, or poultice to treat boils, eczema, herpes, poison ivy or oak, and sore muscles. The freshly pressed juice of the plant can be applied topically to ease the pain of toothache. Some Native American tribes believed that placing a leaf in the bed of a quarreling couple would help them regain their love. Lobelia was both chewed and smoked by Native Americans. The alkaloid lobeline mimics the effects of nicotine, and thus this herb can be helpful for people wanting to give up tobacco. Avoid overdosing, as overdose can cause sweating, nausea, vomiting, pain, paralysis, lowered body temperature, rapid pulse, coma, and even death. Lobelia is best used in combination with other herbs and in small amounts, one-fifth to one-third the amount of other herbs used in a formula. Avoid during pregancy or in cases of hypotension, hypertension, fainting, paralysis, shock, pneumonia, or fluid surrounding the heart or lungs. Lobelia inflata is much more emetic than other varieties; Lobelia siphilitica is milder and less likely to cause vomiting. However, an emetic, which causes vomiting, is sometimes a desirable therapy to help the body eliminate a poison or to stop an asthma attack. The fresh leaf has caused contact dermatitis in rare cases.